This dog hooded sweatshirt is made from soft 65% cotton and 35% polyester for comfort. The durable hooded sweatshirt won't break when they are playing indoors or outdoors. It's a great option in the spring, winter, autumn or cool day. 3. RIBBED DESIGN - Ribbed design sleeves, neck, and waist to ensure a comfortable fit and wind-resistant keep warm. 4. UNIQUE DESIGN - Classic and comfortable hooded sweatshirts feature a pocket on the back for style and a small opening hole on the upper back of the coat for dog harness users, pure color sweatshirts look more simple and graceful. 5. UNIQUE DESIGN - Designed for your lovely pet with pullover design that makes it easy to put on and take off. 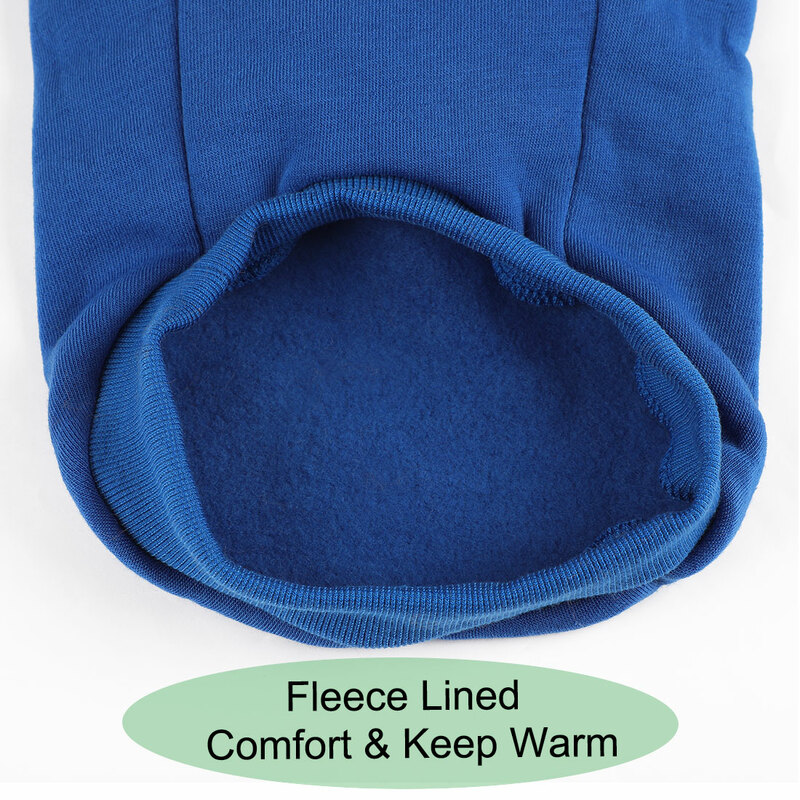 Suitable for pets' daily wearing, parties etc, keep the dog warm in cold or windy weather. Make your pet cuter. 6. COMFORTABILITY & MOVEMENT - When your dog first puts on our clothes, they'll see how light and easy it is to move around. We made it a big focus to keep our clothes fashionable without restricting the dog's movement. Lightweight, soft, and made for mobility. 7. ATTENTION - Cotton fabric is soft naturally, without odors. The sweatshirt makes your little pet stand out in a crowd. There are various colors and sizes for you to choose from. Please measure carefully before buying, and take each measurement a bit loosely, so there will be room for your dog to move and breathe, but not too loose. 8. EASY to CLEAN 鈥?Can be easily cleaned with your regular laundry; Machine wash cold on gentle cycle and air dried for the best results. XS: Back Length: 19-21cm/7.5"-8.3"; Chest: 29-33cm/11.4"-13"; Neck: 19-21cm/7.5"-8.3"
S: Back Length: 24-26cm/9.4"-10.2"; Chest: 35-39cm/13.8"-15.4"; Neck: 23-25cm/9.1"-9.8"
M: Back Length: 29-31cm/11.8"-12.2"; Chest: 41-45cm/16.1"-17.7"; Neck:27-29cm/10.6"-11.4"
L: Back Length: 34-36cm/13.4"-14.2"; Chest: 47-51cm/18.5"-20.1"; Neck: 31-33cm/12.2"-13"
XL: Back Length: 39-41cm/15.3"-16.1"; Chest: 53-57cm/20.9"-22.4"; Neck: 35-37cm/13.8"-14.6"
XXL: Back Length: 44-46cm/17.3"-18.1"; Chest: 59-63cm/23.2"-24.8; Neck: 39-41cm/15.3"-16.1"
XXXL: Back Length: 49-51cm/19.3"-20.1"; Chest: 69-73cm/27.2"-28.7"; Neck: 43-45cm/16.9"-17.7"
1. Your dog usually wears size L does not mean fit our size L sweatshirt certainly. Please compare the bust, back length, and weight of your dog with our size chart before you buy. You may need to order a size bigger if your pet's size is at the end of border. 3. If your dog is between sizes. Please choose large sizes, a bit loosely will be more comfortable for your pet. 4. The size selection of clothes is recommended to be about 2-3cm wider based on the size of pets.